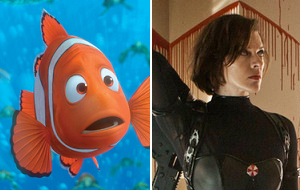 The combined power of Finding Nemo 3D and Resident Evil: Retribution will help the box office rebound after one of the worst frames in years. When adjusting for inflation, no Disney/Pixar collaboration has topped Finding Nemo's $451.8 million domestic haul. The tale of a father fish looking for his lost son is a very popular one and with the market in something of a slump right now, we're betting that families will jump at the chance to see a beloved film in a new way. Finding Nemo 3D looks poised to live up to the standards of The Lion King 3D, a solid $176 million worldwide hit. As of 4 p.m. PT, Fandango reports that Finding Nemo 3D accounts for 23% of daily sales. Look for Finding Nemo 3D to grab $30 million from around 2,900 locations during its debut frame. 2009's Resident Evil: Afterlife 3D set a new franchise record with $296.2 million worldwide. That's surprising considering that it was the fourth Resident Evil film. By now, fans know what to expect from the Resident Evil franchise and Retribution promises more of the same. Still, every franchise must end at some point and we think that a slight domestic drop is likely. Fandango reports that Resident Evil: Retribution accounts for 16% of daily sales. Resident Evil: Retribution should take in $21 million from around 2,850 locations this coming weekend. Keep a close eye on The Last Ounce of Courage this weekend. The independently-produced film will appeal to the same conservative crowds that have been devouring 2016: Obama's America. The Last Ounce of Courage should manage $3.5 million from around 1,400 locations.